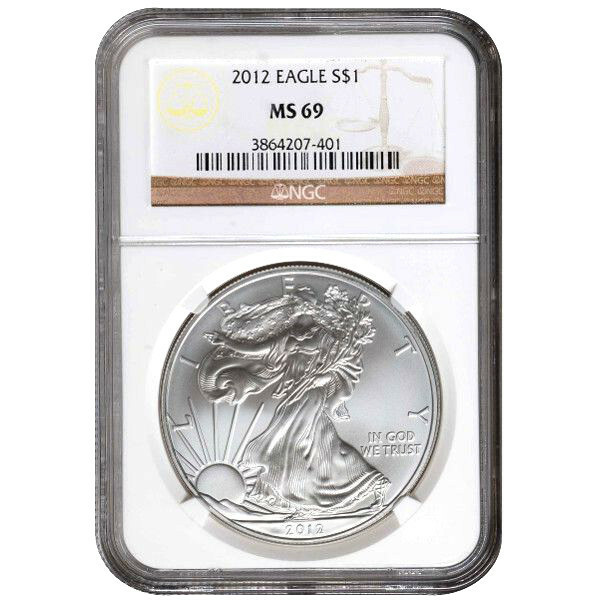 You can now own a 2012 1 oz Silver American Eagle Coin with an NGC rating of Mint State 69. Aside from their nearly flawless condition, these coins also contains 1 troy ounce of 99.9% pure silver and hold a legal tender value of $1.00 USD. The bald eagle is the national emblem of the United States of America, and it has been since it was selected by the Founding Fathers in 1792. Eagles are renowned for their majesty, power, and longevity. These are all characteristics that America’s early leaders saw in the spirit and personality of the American people. The Silver American Eagle coin is the official silver bullion coin of the United States government. Congress authorized the production of the coins under the Liberty Coin Act, which was approved on July 9, 1985. The purpose of the coin program was to help the federal government raise funds during the 1980s by releasing silver stores from the Defense National Stockpile. Under the program, coins are allowed to be produced by the US Mint using only silver that is sourced within the United States. In 2002, Congress authorized an extension to the program that permitted the Treasury Department to purchase additional silver on the open market once stores from the Defense National Stockpile were exhausted. On the obverse side of the 2012 1 oz Silver American Eagle NGC MS 69 coin is the image of Walking Liberty, as designed by Adolph A. Weinman for the Walking Liberty Half Dollar between 1916 and 1947. In the image, Lady Liberty is seen walking toward the setting sun. Engravings include “LIBERTY,” “In God We Trust,” and the year of minting. The reverse side of the coin includes John Mercanti’s heraldic eagle design. In the image, an eagle is set behind a shield with arrows in one talon and an olive branch in the other. Above its image is a set of 13 stars, representing the original American colonies. Engravings include “United States of America,” the weight, metal content, purity, and face value of the coin. The US Mint was founded in 1792 to serve as the official minting facility of the new nation. Today, Silver American Eagles are produced at the Philadelphia, West Point, and San Francisco branches of the US Mint. The Numismatic Guaranty Corporation has graded this 2012 Silver American Eagle as MS69, which means the coin has a very attractive, sharp strike and full original luster for the date and mint mark. Silver.com wants all of its customers to be happy with their purchase. 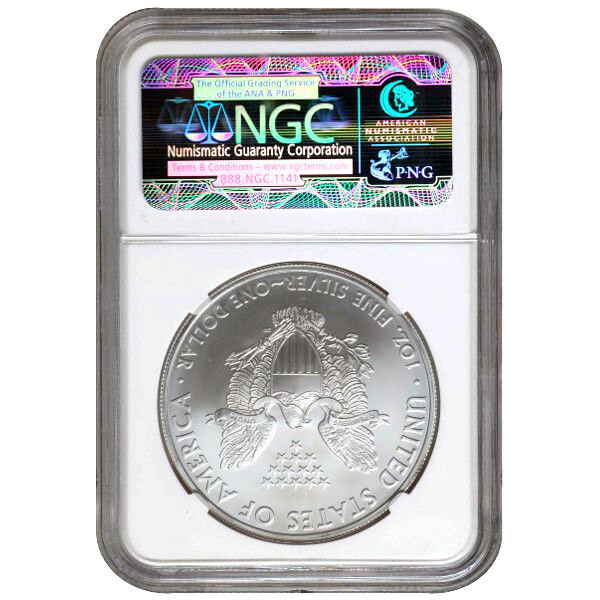 If you have questions about the NGC MS69 2012 1 oz Silver American Eagle Coin, or any other product we offer, please contact our associates directly at 888-989-7223. Our representatives can also be reached through email or the website’s live chat feature.